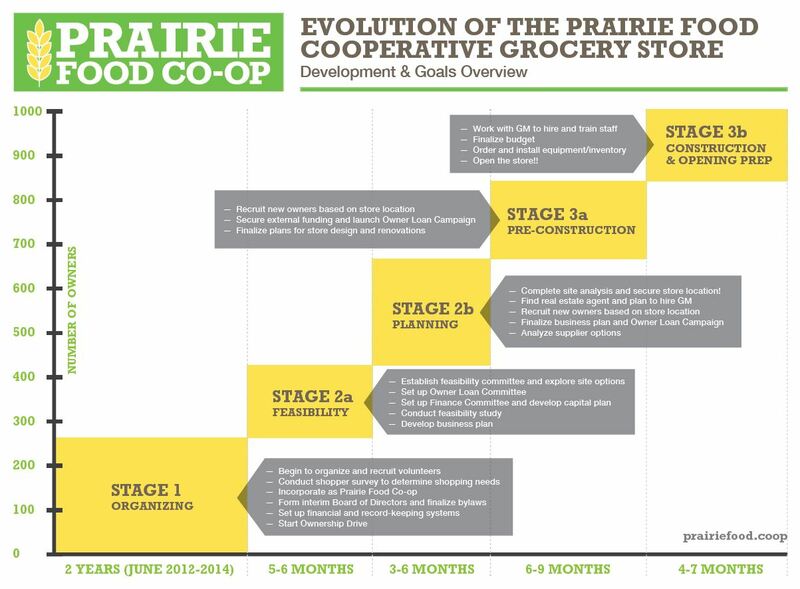 The time it takes to open a new co-op is anywhere from 3 – 5 years (sometimes a bit longer) and is dependent on many factors: how quickly we build our ownership, secure a permanent location and financing, and hire a talented General Manager. All of these key pieces must be in place to open the co-op and, as you can imagine, we encounter both triumphs and challenges along the way which affect the overall timing of the project. Since the beginning of our organizing efforts in mid 2012, we’ve taken advantage of the vast resources available to help new co-ops get off the ground successfully. As the saying goes, “why re-invent the wheel?” The “wheel” is a development model based on co-ops’ best practices in establishing a new co-op. It, along with the corresponding support from industry-specific expertise, has guided us and keeps us focused as we navigate through this multi-faceted, complex process of opening a member-owned, full-service grocery store in an increasingly competitive marketplace. Based on the Market Analysis, we can move forward with recruiting enough Owners to secure a lease on space, develop a concise business plan, and secure the funding necessary to open an amazing, vibrant, one-stop grocery store in Lombard! Now, that sounds like a plan!